Optical detection and ranging is recognized as one of the key sensing technologies needed to support increasingly sophisticated active safety features on production cars and to develop autonomous driving solutions. One of the leaders in solid state LiDAR for the automotive market, LeddarTech, forecasts that the global market for ADAS (advanced driver assistance systems) technology will grow rapidly to over $60 billion in revenue by 2020. LiDAR technology will become a central element of the autonomous vehicle’s sensor suite, alongside existing technologies, ensuring robust sensing redundancy and increasing overall system reliability, says the company. A partnership of leading-edge suppliers has joined forces as the Leddar Ecosystem in order to take LiDAR (Light Detection and Ranging) technology to market. They include LeddarTech, Texas Instruments (TI) for microprocessors, Hamamatsu, Excelitas, OSRAM and TriLumina for optical components, PolySync and Intempora for software development tools, and Global Sensing and AKKA Technologies for perception and navigation intelligence software. “Leddar-based solutions bridge today’s LiDAR technology gap, and will take LiDAR mainstream as our clients transition from today’s autonomous car prototypes to high-volume deployments. 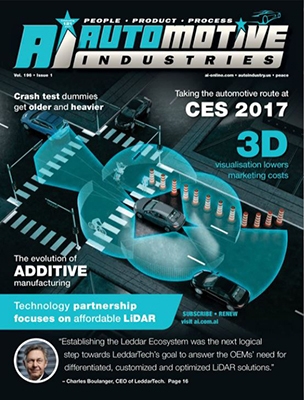 The 3D solid-state LiDAR solutions presented at CES reflect th unparalleled strengths of LeddarCore ICs and our compelling automotive development programs currently under way, which stem from LeddarTech team’s unique LiDAR expertise,” says Charles Boulanger, CEO of LeddarTech. Leddar sensing solutions for automotive applications were showcased by various high-profile exhibitors at CES 2017, including Fiat Chrysler Automobiles (FCA), Magneti Marelli, OSRAM, FEV, TI, DLH Bowles and TriLumina. LeddarTech’s solid-state LiDAR technology, which delivers both high resolution and long range in a small, robust package, is being offered as a cost-effective alternative to expensive, bulky scanning LiDARs being used today in autonomous vehicle development programs. The new solid-state LiDAR sensors are now available at volume pricing below the $100 threshold, which will enable the successful commercial deployment of semi-autonomous and autonomous vehicles, said a statement from the company. Automotive Industries (AI) asked Boulanger what the benefits are of LeddarTech’s technologies for automotive OEMs looking to develop connected and autonomous vehicles.